The final itself was a gripping affair. 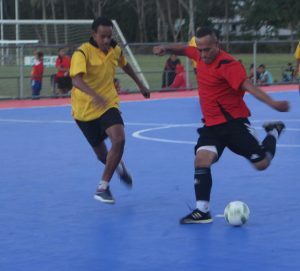 Halafuoleva consists of old and experienced players from 11-aside football and they participated just to have fun and to boost their fitness as part of their preparation for the TFA’s Major League later on this year. Futsal is only three years old in the Kingdom, but one of few most attractive game to all levels. This time Halafuoleva made history though, beating young and fast Veitongo team in the semi-final 6-3, and again defeated the most experience players of the Kolomotuá Eagle in the final 3-2. The Halafuoleva’s head coach is Lafaele Moala and he was also a player as well. ‘’I was not sure whether to prepare a team before the beginning of this tournament. Then a week before the kicked off, I met the rest of my players and we agreed to participate just for fitness and for fun,’’Moala says. ‘’Our way to the top was not easy, but we worked together, made a lot of sacrifices and on top of that we fully committed, I wanted to congratulate the Kolomotuá Eagle team for giving us a tough and a good game,’’ Moala added. First time champions Kolomotuá Eagle finished runner up, with Lotohaápai third. The Halafuoleva team captain is Kilifi Uele and he scored 2 goals to secure their win. ‘’My team mates deserve all the credit, as we put together all our efforts on the field and we won,’’ Uele says. ‘’I just want to remind the young players do not underestimate us,’’ Uele added. A total of 18 teams senior men took part in the futsal tournament this year.